Men and women, clad in their respective police uniforms, traveled from every state in America. 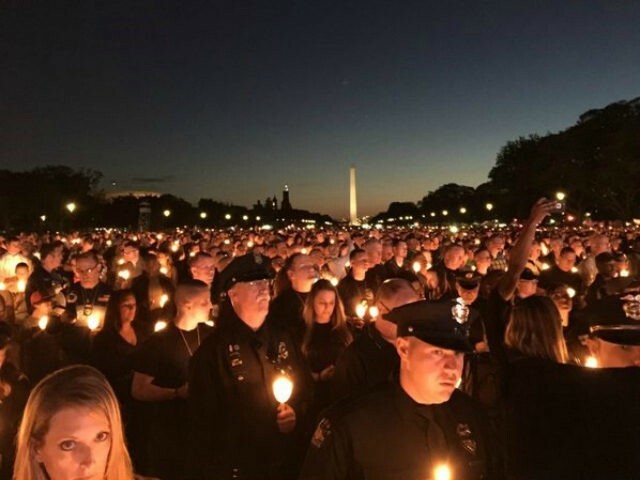 Some joining from several countries, gathered for a candlelight vigil for the 252 fallen officers whose names were recently added to National Law Enforcement Officers Memorial. The 28th Annual Candlelight Vigil was part of National Police Week. “It’s very emotional,” said Rich Leotta, whose son, a Montgomery County Police officer, was killed last year by a suspected drunk driver. “I’ve been going through ups and downs the whole time. This is overwhelming,” she said. Speakers at this year’s event include Attorney General Loretta Lynch, Department of Homeland Security Secretary Jeh Johnson, and president of Concerns of Police Survivors Brenda Donner. The National Law Enforcement Officers Memorial Fund’s official Twitter page posted a video, which shows the additions made to the memorial walls. This year’s ceremony was held at the National Mall due to construction near the police memorial. CrimePoliticsPre-Viral#policelivesmatterJeh Johnsonloretta lynchNational MallNational Police WeekPolicepolice officerswashington d.c.